What was it like being taught by Leavis? This chapter contains a personal account of Leavis as teacher by the author, one of the last generation of students to be taught by him at the University of York. 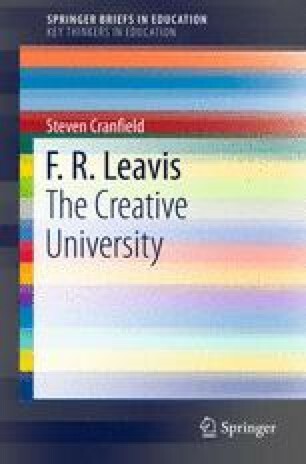 It briefly summarises an extensive literature about Leavis’s teaching before going on to discuss the impact on the author of his teaching style and methods (in lectures, classes and reading seminars). The teaching approach adopted in Leavis’s seminar reading of Eliot’s poetry is explored and illustrated. Using the concept of supplementarity to frame the account, considerations are raised about what counts as ‘being taught’ when the teacher is as potent a thinker and practitioner as Leavis and which his particular example serves to accentuate. Robinson, I. (2011). F. R. Leavis the Cambridge don. Newark: Brynmill Press. Retrieved May 16, 2015, from http://www.edgewaysbooks.com/ebooks/04leavis.pdf.